Review: Spinners Book of Fleece, the missing link! I think if you’re sort of learning on your own, and you don’t have access to a breed study workshop and you don’t know anyone else that spins: This book is your new friend. I also think experienced spinners will be delighted with having all this detail in one reference. The production quality is very high and the photography is lovely. I’m not exactly a fashion guru but I’m sure this is a very now blue. Fleece and Fibre Sourcebook covers sheep breeds, but also fibres from other animals. It has tips on processing and spinning the fleece which is typical of given breed. Simply due to the breadth, it doesn’t cover selection or scouring. Respect the Spindle includes great details on spindle selection use and the science behind it. In terms of fibre it does cover different types, but only commercially prepared wool. It doesn’t cover fibre prep and finishing yarn (much). Spinners Book of Yarn Designs covers spinning and plying in great depth, but not much detail on specific fleece or fibres, and not colour. It’s all about plying and texture, but again, very little on finishing yarn. That is done on purpose, to eliminate some variables. Choosing the source. Purchasing and breed selection. Best scouring, preparation, spinning techniques, finishing for each type. Best applications for these choices of source + preparation + finishing. There’s so much included here that I haven’t seen covered much in other books and not much online either (unless you mine the rich ore of Ravelry). Did you know you could reconstitute the crimp in a commercially prepared fibre which has been compressed for so long? Had you considered the degrees of fulling yarns when setting twist? Or why you would? I’ve seen instruction on how to “thwack” the yarn, but hadn’t considered the degrees to which you might do this and to what effect. For this reason, I think even experienced spinners will find something surprising in this book. It’s really the perfect companion to put in practice the info in the Fleece and Fibre Sourcebook, and help you prepare for using your spindle (Respect the Spindle) and making gorgeous yarns (Spinners Book of Yarn Designs). Beth Smith’s main message: PLAY! My biggest take away is what Beth Smith refers to as “sampling”, which is what the book made of: lovely, inspiring, intriguing samples. The sample photos show lots of detail. 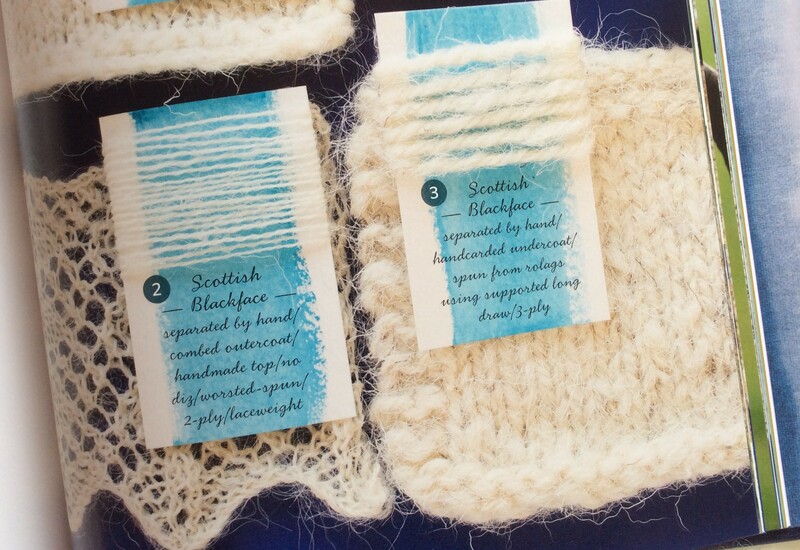 For example a tag might say “Flicked/worsted spun from cut end/ 2 ply”. Shows detailed notes of prep and plying. I want to get experimenting for its own end and not to “make something”. She makes me want to try more prep techniques and get more textural results such as spinning from the cloud. I tried it in Deb Robson’s Introduction to Wool Types workshop at Fibre East, but felt my lumpy bumpy yarn wasn’t adequate. But that’s what it should be like if you spin from the cloud. Beth Smith makes me want to get organised and undertake my personal breed study. She advises experimenting and keeping records, and provides practical advice on storage, and inspiration of experiments to try. A deft enabler, Beth Smith advises: try a breed at least twice. Because the first time you don’t know what factors are affecting the fleece. She is constantly encouraging the reader to think beyond the reputation of certain wools like the Lincoln. There can be lots of variety in a breed from sheep to sheep. This makes lots of sense to me. She recommends starting with at least an ounce of fleece (28 grams) to get three or more samples per fleece. I wish I had only washed that small amount from my fleece to start. I would like to undo some of the scouring decisions I made. Beth made a brave choice to include some problematic fleeces. For example, a Southdown with lots of second cuts led to a nep-tastic yarn. This gave her the opportunity of advising on handling difficult fleeces, which is great! 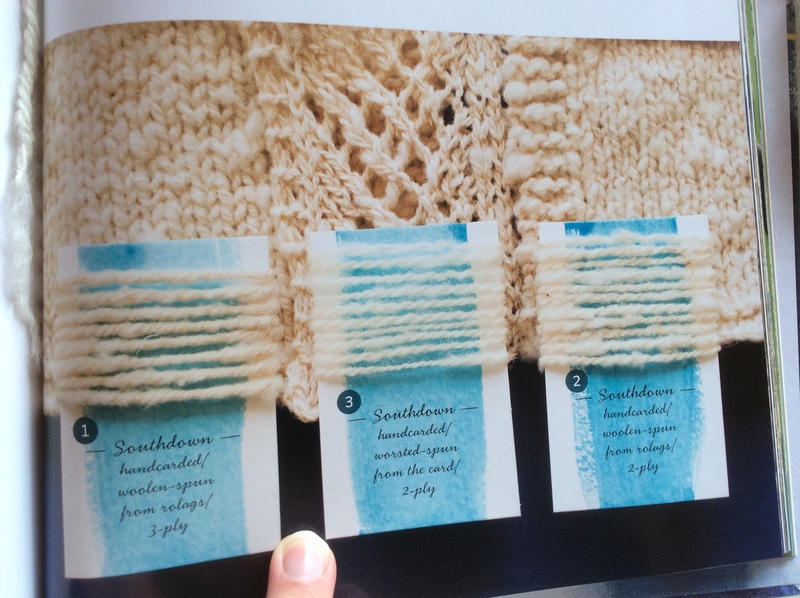 For example, with fine springy yarn, don’t over card. I wrote about my own experience in choosing fleece. Yep, this book could have helped me quite a bit. This book covers fleece selection in great detail. It’s more comprehensive than anything I’ve seen online. She helps you with identifying fleece faults, and even etiquette around inspecting fleece which is something I didn’t know about! The book includes is good mix of UK breeds and many US Breeds I’ve never heard of, but that isn’t really the point. Beth has chosen representative types, with ideas in cleaning, prepping and spinning, plying for each. When you find your new mystery breed, you can use the examples and a guide. Beth has clear opinions on what preparation or spinning technique works best with which types of fleece, which is helpful when you’re starting out. Biased opinions can be very useful way points especially for novices. Beth will say “this is my favourite way to do this” but then she also shows the alternatives. For example, the difference between curved carders or flat ones. She also shows photos of the “right way” to comb, and what the “wrong way” looks like. Being able to detect when you’re doing something “wrong” is a crucial step in learning. I’m delighted to see instructions which include models of incorrect techniques! If you consider the novice’s experience, I believe it’s good to give guidance on “one way that works”, and teaching those rules so you know you’re breaking them and how. I think Beth Smith’s book is a great resource for establishing those rules, if (like me) you don’t already know them. But again, she does talk about alternative methods, and even in her samples she bends the rules and shares the results. Go on and get that puppy sheep! The Spinner’s Book of Fleece You can get a detailed preview here. You can also see videos by Beth about spinning. In fact, I think the video showing her daughter doing ‘park and draft” was a video I saw really early on 🙂 If a kid could do it, so could I.
Spinners Book of Fleece is chock full of inspiration. I’ve just booked my summer “staycation” at home and I’m not sorry I can’t travel because I’ll be elbow deep in fleece 🙂 Thank you Beth for this guidebook, it’s so full of woolly love and care. Next Post UK Fibre events: Spoilt for choice?